BELFAST is getting ready this Saturday to celebrate diversity with a carnival in the city centre. Organised by United Against Racism, the aim of the carnival is to show that diversity is something to be celebrated. This free event will showcase how diverse our community is. People are asked to assemble at 1pm on Saturday September 1 at Writer’s Square to march to City Hall with colourful banners, placards and music to send a strong message that everyone is welcome in our city, regardless of the colour of their skin or the community they belong to. 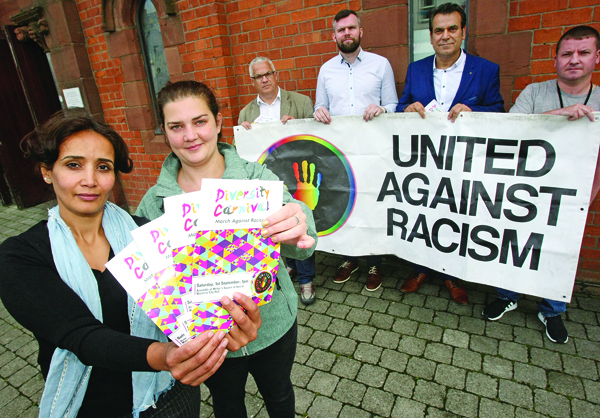 Ivanka Antova, Chair of the Belfast branch of United Against Racism, said: “There aren’t many opportunities for us to celebrate diversity – especially the migrant communities. “Looking at Muslim communities in particular, it’s become an every day reality to make yourself invisible, to conceal yourself, to stay under the radar, to show absolutely no pride and happiness that you are who you are because people target you on social media and on the streets. People hurl abuse at you, they blame you for things that are not in your control, things such as the way the NHS works or how social housing works. People Before Profit MLA Gerry Carroll is calling on people to come out on Saturday. “We saw a bit of a polarisation across the world between the right and the far right, we’ve seen Trump and also the reaction against him, we’ve seen the likes of Tommy Robinson across the water who is really trying to scapegoat Muslims and minorities. SDLP Cllr Tim Attwood said: “The Diversity Carnival is a wonderful opportunity for people to send a strong and powerful message that Belfast is a city for all, regardless of skin, creed or nationality. The Diversity Carnival is a fun, free, family friendly event that is supported by NICRAS, the Stronger Together Network, ArtsEkta, NI Somali Association, Indian Community Centre, trade unions and many more.